Hargreaves teaches English in the Faculty of Creative and Critical Studies (FCCS) and specializes in Indigenous literary and cultural education. Her book, Violence Against Indigenous Women: Literature, Activism, Resistance, was published by Wilfrid Laurier University Press in August of 2017 and was named the winning entry two weeks ago. 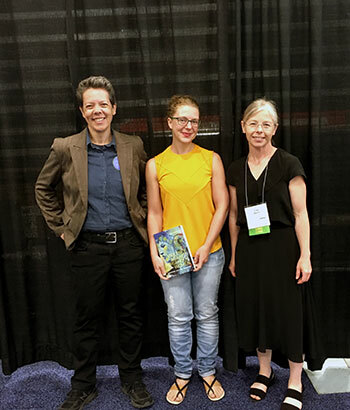 UBC Associate Professor Allison Hargreaves, centre, receives her Gabrielle Roy Prize, pictured here with WLU Press senior editor Siobhan McMenemy (left) and director Lisa Quinn. Violence Against Indigenous Women argues for the important role that literature and storytelling can play in response to gendered colonial violence. Indigenous communities have long been organizing against violence, but the cases of missing and murdered women have only recently garnered broad public attention. The book joins the conversation by analyzing the socially interventionist work of Indigenous women poets, playwrights, filmmakers and fiction-writers. Organized as a series of case studies that pair literary interventions with recent sites of activism and policy-critique, the book puts literature in dialogue with anti-violence debate to illuminate new pathways toward action. “I am honoured by the recognition, and grateful for the attention this may bring to the issues discussed in the book,” says Hargreaves. She also drew attention to local events, particularly the Annual Memorial Vigil for Missing and Murdered Indigenous Women, Two-Spirit, and Girls held annually in Kelowna every February 14. She is donating her prize money toward next year’s event, she adds. The Gabrielle Roy Prize is awarded annually for the best book-length study in Canadian and Quebec literary criticism.